Christian Lindner, leader of Germany's Free Democratic Party (FDP), has called for Crimea's reunification with Russia to be viewed as a "permanent provisional solution." His comments could further cement the issue of European-Russian relations, and anti-Russian sanctions, at the heart of the September 24 general election. Speaking to local media, Lindner said the March 2014 move should be accepted, in order to make progress in other areas — and called for the lifting of associated sanctions, in recognition of Moscow's "positive steps" in fulfilling the provisions of the February 2015 Minsk agreement. "We can and must take lessons from history about how these conflicts can be frozen and then resolved step by step. We have to get out of this dead-end situation," Lindner said. Lindner's comments starkly contradict the FDP's official election platform, which states the Russian government should put an immediate end to the "illegal occupation" of Crimea. Nonetheless, other statements in the same interview suggest such a policy stance was adopted out of conformity — Lindner said he was merely verbalizing what "many others" also thought, and had already "quietly" been effective German government policy "for a long time." While Lindner's statements attracted some public condemnation — Social Democrat (SPD) MP Gernot Erler, the country's Russia policy coordinator, cautioned against breaking ranks on the issue — many members of Europe's political and industrial elite will surely be thankful for the leader's willingness to place his head above the parapet. The legal March 2014 referendum in Crimea saw 93 percent of voters support reunification with Russia and on March 17, the Supreme Council of Crimea on the basis of the referendum results passed a resolution on the independence from Ukraine. The reunification was used as justification for the imposition of anti-Russian sanctions by Western powers. While initially European leaders were unquestioning in their support for the US-dictated program, many quickly found these punitive measures were having a deleterious effect not on Russia, but their own economies — and the nigh on total lack of popular support for rejoining Ukraine among Crimeans themselves made clear the restored state of affairs in the region was there to stay. In July, the sanctions came up for renewal — and without consultation with European governments, US legislators enthusiastically pushed ahead with even more punitive measures than previously. 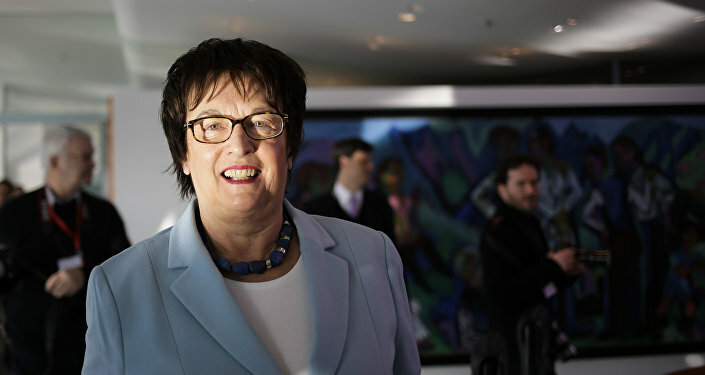 The development has been an unwelcome one across the continent, with German Economic Minister Brigitte Zypries stating the sanctions violate international law, and suggesting a trade war could impend between the European Union and US if the latter does not ease them. Similar criticisms have issued from ministers in Austria and France, among others — yet Lindner is one of the first mainstream politicians to openly acknowledge the fundamental basis of the sanctions itself is without merit. Previously, French National Front leader Marine le Pen stated publicly there was no "invasion" of the region by Russian forces. His comments are doubly significant, as polls indicate the FDP could re-enter the Bundestag in the September 24 election, after dropping below the required five percent minimum threshold in 2013. Pundits increasingly view the party as a likely coalition partner for Chancellor Angela Merkel's ruling Christian Democratic Union (CDU), as there are suggestions she is keen to shelve her alliance with the SPD. Moreover, given German businesses and citizens alike favor warmer relations with Moscow, Lindner's intervention could boost the party's support further. Should the demands of Lindner and other European politicians fall on deaf ears in Washington, the continent could well pivot away politically and economically from the US, and towards a more independent, rational economic and foreign policy — especially if the sanctions inflict further damage on European economies, as many analysts predict.